Sept. 25 vs. Eastern Michigan - 5 p.m.
Sept. 27 at Bowling Green - 1 p.m.
Oct. 2 at Toledo - 4 p.m.
Ball State traveled to Morehead State on Sept. 20 and took home a 3-1 victory over the Eagles. Roberts became the second Ball State soccer coach to reach 50 career victories, joining Ron Rainey. The Cardinals finished the non-conference portion of their schedule with a 4-2-2 record. Against Morehead State, Ball State faced some adversity late in the game. The Eagles (3-5-1) took the lead in the 68th minute on a penalty kick. 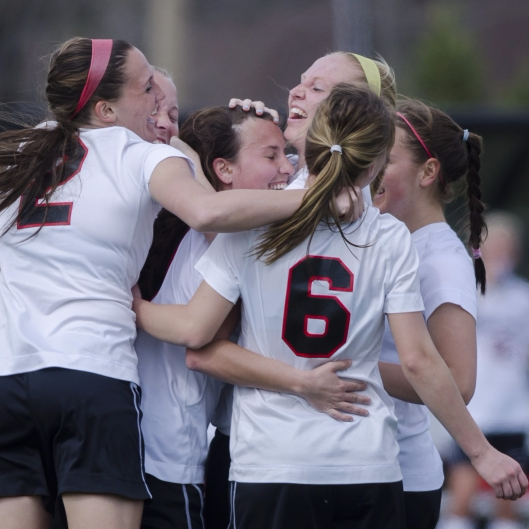 This fueled the Cardinals, as they finished the match with three goals in the final 20 minutes. Ball State outshot Morehead State 24-3 in the match with a 15-3 shots-on-goal advantage. Freshman Abbie Boswell scored her third goal of the season in the 70th minute, tying the match at 1-1. The Cardinals then scored two goals within two minutes of each other. Senior Chelsy Shwackhamer scored in the 85th minute and junior Gabby Veldman added some insurance in the 87th minute to pull away. The Cardinals ended the long road trip with a 2-1-2 record after playing matches at LSU, IPFW and Indiana, in addition to Morehead State. Ball State will begin Mid-American Conference play on Sept. 25 with a home match against Eastern Michigan. Ball State broke the soccer attendance record with its home opener against Wright State, and Roberts said he hopes to see many of the Cardinal fans for the MAC home opener. Playing on the road has prepared them for MAC play, he added. “We know how to play on the road, and it was help us as we move into MAC play where we expect to do good things,” Roberts said.